The Apollo Edge Dive Boot are a comfortable and sturdy boot for the budget conscious. They have been designed with the contour of your leg in mind and provide superior comfort and fit while walking and in the water! The heavy duty zipper is extremely durable and the toe cap and heel cap provide great feet protection! Available in AUS/NZ sizes 3 (XXXX-Small) to 14 (XXXXX-Large) there is a comfortable option for almost every diver. 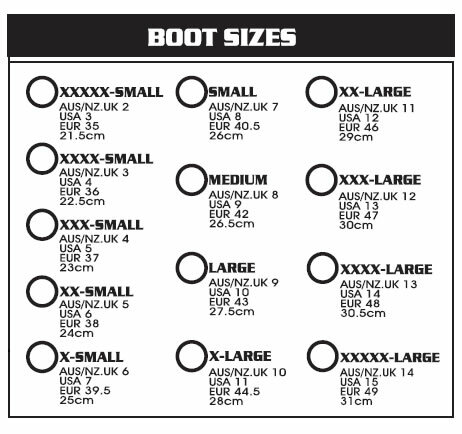 The sizing chart from Apollo below indicates they have sizes 2 to 14 in these boots, but only AUS/NZ/UK sizes 3 to 14 are actually available in Australia.